The release this week of the Intergovernmental Panel on Climate Change's (IPCC) special report on global warming of 1.5℃ above pre-industrial levels marks a critical point in climate negotiations. Billed in the media as "life changing," the report illustrates how crossing the ever-nearer threshold of 1.5℃ warming will affect the planet, and how difficult it will be to avoid overshooting this target. The special report takes a worldwide look at the growing impacts of climate change. 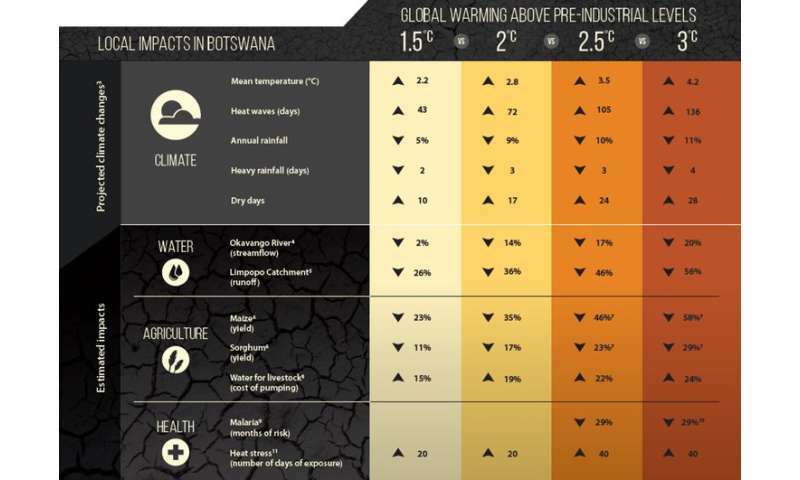 For climate change "hotspots" – hot, dry and water-stressed countries like Botswana and Namibia in southern Africa – local warming and drying will be greater than the global average. The report underscores the urgent need for countries like Botswana and Namibia to prepare and adapt – and do so quickly. The Paris Agreement's goal of limiting global warming to well below 2°C, ideally 1.5°C, by the turn of the century will be extremely challenging. To date, mitigation pledges by nations fall far short of what is needed, with global temperatures on track for a warming of 3.2°C by 2100. Under an increasing emissions trajectory, the 1.5°C threshold could be breached as early as the next decade, and the 2°C mark the decade after. 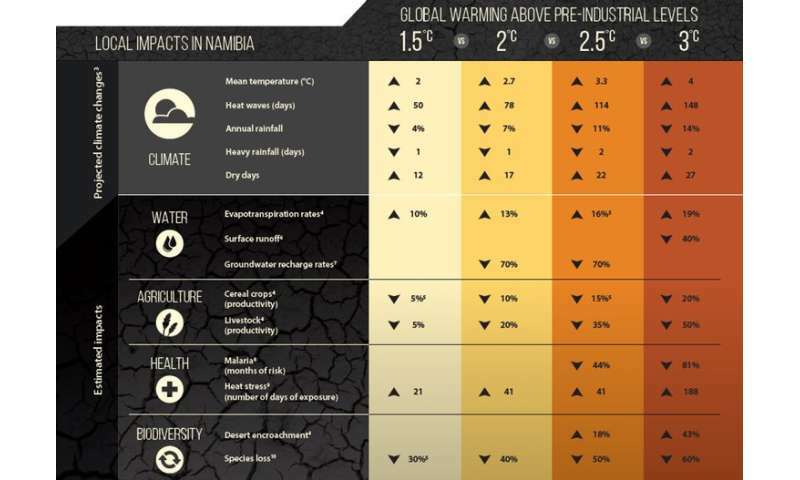 Our analysis of the effect in Botswana and Namibia of 1.5°C, 2.0°C and higher levels of global warming shows that they're likely to get hotter, drier and more water-stressed. The sooner southern African countries prepare and implement adaptation strategies the better. Botswana and Namibia already know the challenges of droughts and floods. A few years ago, Botswana's capital city Gaborone was on the brink of running out of water as the country battled its worst drought in 30 years. Neighbouring Namibia has battled with recurrent and devastating droughts and floods in recent years, especially in its northern regions, where most of the population live. What global warming of 1.5°C. and higher means for Botswana. What global warming of 1.5°C. and higher means for Namibia. In a hotter, drier future there will be less domestic water available. 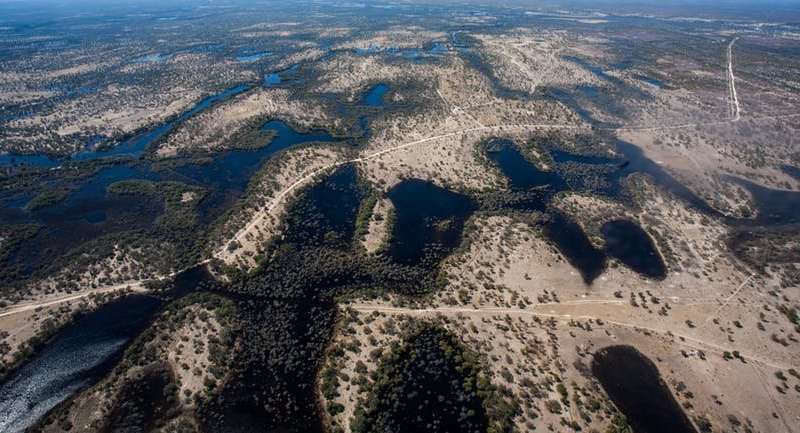 Runoff in Botswana's Limpopo catchment is projected to decline by 26% at 1.5℃ global warming, and by 36% at 2.0℃. In Namibia, evapotranspiration rates increase by 10% at 1.5℃ global warming and by 13% at 2.0℃, leading to reduced river flows and drier soils.